When you’re cooking a big Thanksgiving dinner, you want at least one super-easy side dish to create time for wrestling with the turkey and making complicated desserts. I’ve got one for you: It’s simple, quick, involves a vegetable that’s in season across much of the the country, and really delicious (so I think). I’m referring to roasted broccoli. Broccoli is a somewhat loathed vegetable, probably because it’s often steamed to the mush phase and spiced with little more than a squeeze of lemon. This is a dish to convert the broccoli-skeptical. In this technique, you roast the humble crucifer until it still retains some crunch, but it is lightly browned in spots. The caramelization concentrates the sugars, bringing out broccoli’s hidden sweetness. You balance that sweetness with plenty of garlic, hot pepper, olive oil, and a dash of something acidic, either lemon juice or vinegar. And while it works well as a side, you can also turn it into dinner by tossing it with pasta, parsley, toasted walnuts, and grated hard cheese. The whole beast, veggie style: don’t toss the stems—they’re really good. Preheat oven to 375. 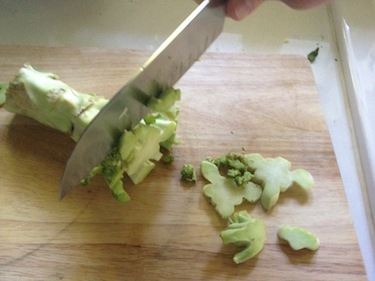 Cut the broccoli florets into more-or-less bite-sized pieces, and add to a bowl large enough to comfortably accommodate them. You’ll have plenty of stem left over—and the stem has good flavor. So thinly slice a bit of the stem, starting from the floret side (see picture), and add it to the bowl with the florets. About an inch’s worth of sliced stem from each broccoli head will do. Add a couple of glugs of olive oil to the bowl, and then a good pinch of sea salt and several grinds of black pepper. Using your hands, toss the broccoli pieces well, making sure they’re evenly coated with the olive oil and seasonings. Add the seasoned broccoli to a roasting pan or oven-proof skillet large enough to accommodate them in a single layer. Place it in the preheated oven and roast for 10-15 minutes. Meanwhile, finely mince the garlic and (if using) the fresh chili pepper. When the florets have just begun to brown, remove the pan from the oven and add add the minced garlic and chili pepper (or dried chili flakes). Toss well with a spatula, and return pan to the oven for another couple of minutes. The broccoli pieces are done when the florets are browned in spots but still slightly crunchy. Finish with a few dashes of vinegar or freshly squeezed lemon juice, and taste for salt. This dish can be made ahead several hours and is just fine served room temperature.